You know the top two already, right? It's the double for Breath of the Wild, though the vote count couldn't have been much closer among our staff. Everything has pretty much been said about this one - it's transformed what we've come to expect from Zelda titles, and has won plenty over with its new approaches and ideas for the franchise. It's another double, and a pretty comfortable win for this slice of 'new retro'. We feel this was a fantastic release for older Sonic fans seeking a return to the original style and top form, while it's also an excellent game for younger players to experience. Bursting with colour, energy and imagination, it's quite simply the best Sonic game in years. =Second Place: Snipperclips - Cut it out, together! Rather like in the community vote this was a comfortable winner, courtesy of a relatively quiet year on the 3DS and the high quality of the end result. The first '2D' Metroid in years, it pushes all the right buttons and also adds some intriguing modern flourishes. When it comes to the winners the community and staff keep agreeing, with these retro re-releases once again seizing the day. Such has been the success of the gen I and II arrivals on the Virtual Console we wouldn't be surprised if there are more to come. This vote could not have been closer, with one point separating them in the end. Our staff certainly had a tough time choosing between this and the runner-up, which is a testament to the impact of both games. Another double winner then, but where does this stand among the great Zelda games? Well, it's undoubtedly in the conversation as the best ever, but there's a flipside to the argument - how do you compare it to predecessors? Such is the ambition of the game and its approach it's difficult to put it directly side-to-side with what came before. Whatever the case in that debate, most seem to agree that it's a very special game indeed. That's it, then, the 2017 Nintendo Life Game of the Year Awards. A big thanks to everyone that took part in voting, and here's hoping for a 2018 of Nintendo gaming that's just as memorable. Édit : Also Worms W.M.D is underrated as well , but is an awesome game ! Such a great year, full of simply amazing games. Too good a year so many great games didn’t make the cut. But you can’t really argue with those lists. Readers and staff in general agreement mostly too. I've just landed in osaka Airport and Nintendo is EVERYWHERE! Picked Mario Odysse myself but overall I’m very comfortable with the results across all systems. Possibly feel that Mario and Rabbids Battle Kingdom derverves to be in the top five of the Switch, but can’t really argue too much given the caliber of titles. Really great to see the Switch lineup doing so well. Also glad Metroid from the 3DS snuck in for the top overall five titles. Received Mario for Xmas and absolutely loving it. Zelda has had some 200 hours invested and a slew of fun indie games have taken up the rest of the time, particularly old school top down shooters. I remember lining up at Rockefeller Center for hours on end in the cold to get my day one Switch. Wincing as I handed over the thick end of $500. In my opinion, money well spent, it’s been an absolute joy for both me and my little one. Both Zelda and Mario are fantastic! Breath of the Wild is truly fantastic and it's great to see it atop yet another list. I can't remember ever feeling so amazingly awestruck when playing any other game in my entire adult life. It is my all time favorite game. Rocket League over Sonic Mania by a country mile! I understand we were waiting a longtime for a proper S&K followup, but let's not be ridiculous. Staff looking silly for excluding Xenoblade 2... Mario & Rabbids is not the better game and again I don't think it's that close. Overall I like the Reader lists better, too. I'm shocked that Zelda won. It always seems to me like here no one likes it. A bit like trying to pick the best leaf on a giant redwood. Nintendo was bigger and more impressive than any other platform or publisher this year, with 30 odd brilliant games to keep our attention. Glad to see Sonic Mania win the eshop game. Pretty deserving, though I’m disappointed Yooka-Laylee isn’t even on here. I hate when a game becomes popular to hate online. I really enjoyed it. No real surprises. Good list of games. Nintendo had a pretty good year. Breath of the Wild was really one of those rare games that only comes along every so often. And you know it really must be a good game if it handily beat Mario. Because Mario is for the masses, and usually any time a new big Mario game hits the shelves it always wins. My only gripe would be Blaster Master Zero not winning one of those eshop categories. That is a pretty good game. An old Pokemon game? @troj27 Yeah, especially with Style Savvy getting fourth place. That's why I question the staff of Nintendo Life so much on their taste in games. @Whopper744 For me it has nothing to do with hate, I just didn't vote for it. I've been waiting for it for years (as a KS backer), wanted to like it, but when I got to play it simply couldn't stand it. With all of these other indisputably great games that people could vote for, I don't think YL not being in any of the lists has anything to do with hate; it simply doesn't stand a chance in comparison. "for retail and eShop for both current-gen systems"
RIP indeed, poor Wii U. Between Sonic Mania and Mega Man 11 hype, no gamer would be in a position to ask why Koei's Warriors games don't fix what wasn't broken. XD Although while the first two Sonics I've finished so far were fun, I don't feel like that was enough for me to prefer them over Sonic Team's aspirations of trying new stuff regardless of sales and whims (which is always a rare but welcome luxury compared to the general humiliating yoke that audience-driven commercial fiction has to carry). My interest in Sonic remains peripheral, but chances are I might end up with Forces on my Switch far ahead of Mania, especially since it's a flagship entry. Not that Mania creators' work isn't impressive on its own regardless - and cheers for all the odds of Mania 2 they may earn a shot at. In general, a more or less expectable list. It was one heck of a year in video games. Onward to 2018! @Oscarzxn No. The people who didn't like it are just a loud minority. I pretty much agree with everything here, other than I feel like Golf Story is sadly missing. I thought Thomas left Nintendo Life? Is he still writing for them? On a personal level, I'm really happy to see Splatoon 2 get some love. I knew it would never win against the likes of Mario and Zelda but It's such a great game and a very important one for Nintendo. It's proof that new IP's can be embraced by a fan base who all have their traditional favourites. New IP's are important to keep Nintendo "fresh" (pun intended) for a wider audience. Splatoon 2 is my favourite game on the Switch and I've almost put in the same amount of hours as Zelda. Nintendo also supports that game extremely well and for free! Truly solid results! It's a testament to how strong of a release year Nintendo systems have had. It's even more telling how strong the winners were when both the staff and reader lists coordinate perfectly. I’m just glad there were so many legitimate contenders. I can remember the last time Nintendo put out so many great games in a single year. Editor's lists feels too biased for me, glad to see some interesting choices in Reader's votes. I'm glad to see Xenoblade and Dragon Quest VIII get some love. This has been quite an explosive year. Super Mario Odyssey is my GOTY, though. Super Bomberman R, Miitopia, and Brave Dungeon were great too. All underrated, though. Botw was my number 1 by a country mile. Breath of the Wild is the best game Nintendo has made in more than a generation, and SMO, Xenoblade 2, etc. are no slouches either. And that's not including fantastic third party releases like Mario + Rabbids and Stardew Valley, either. I was kind of surprised to see Metroid take best 3DS Game over Pokemon Sun and Moon Ultra. On the other hand, the shake up is kind of refreshing. I'm living on Titans at the moment. Blimey what a year. Just because the staff didn't pick your favorite genre specific title doesn't mean you can't trust them. Different people enjoy different games: that's why platformers, dress up games, and metroidvanias exist and not just every new game being an FPS or turn based combat RPG. Most of the staff at Nintendolife were either forced or "volunteered" to play nearly every Nintendo game that came out this year. They picked the ones they found relaxing and fun, just as we did. Very cool to see that the staff and community choices more or less line up with each other. I do have to vote to disagree about 3ds goty as I thought samus returns was average at best. My vote went to Culdcept Revolt. If I could choose again I would have probably chosen Fire Emblem Echoes (though that season pass nonsense still leaves a bit of a bad taste in my mouth). Lastly it's interesting but not surprising to not see Arms in the top 5 of either 2 lists. For me personally ( I know I'll get some flack for this) I would have liked to see Nintendo support this game for a longer amount of time with significant content updates. With dr coyle being the last update, 6 months of support (barring any balance changes they make in the future) is not enough for a fighting game especially considering that games like injustice 2 and even disappointing fighting games like street fighter 5 are still receiving new content almost 2 years on. @Oscarzxn I wouldn't say that no one like it's. It's more that people (myself included) think its merely a good game and not the 10/10 masterpiece everyone claims it is. Speaking for myself while I enjoyed it, there were a lot of significant flaws for me from both a story and gameplay standpoint that prevent it from being my favorite Zelda or even open world game. 2017 is the year Nintendo took it back. They were the underdog coming out of the Wii U era (RIP my beloved Wii U), but they are once again, the king of the hill. They came out swinging this year and thier relentless release schedule was staggering, especially Oct/Nov. I can't help but think 2018 will be a "cool down" period but if it turns out to be anything like this year was, I think my mind will explode. Not 100% sure Sonic Mania would make my top 5 in the eShop - but that just shows how good its rivals are. SteamWorld Dig 2 is the easy #1 for me in that category. Otherwise, Zelda: BotW all the way (with Odyssey second). The readership knows what's up! 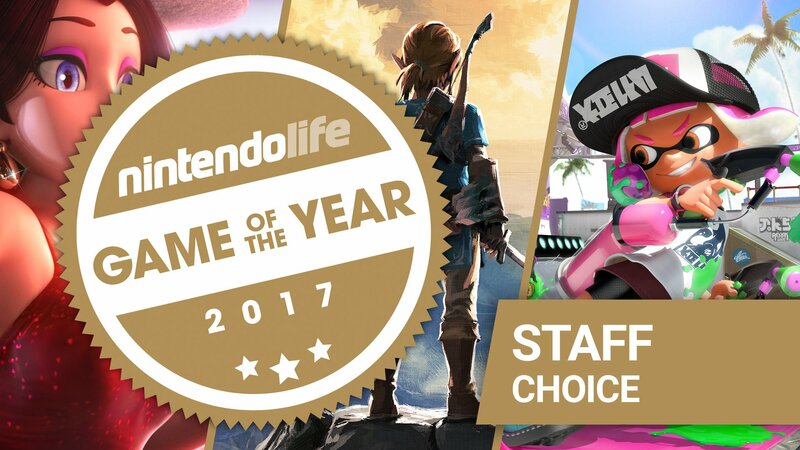 Xenoblade Chronicles 2 was 3rd for overall GotY, while the staff didn't nominate it for a single thing! Look at the quality of that Switch eshop top 5. Wow. Nice to see Stardew Valley getting some love! This years winners was very predictable for the Nintendo switch. Not a bad thing, we all know which games were exceptional as soon as we started playing. Not impossible, to be honest. Due to the small sample size, there sure were some very niche results on the Staff list this year. I'm sure Mario & Rabbids, Snipperclips, and Style Savvy didn't even come close to the amount of Reader votes needed to hit the Top 5 of their respective categories. The fact that Ever Oasis didn't even make the top five 3DS games is appalling to me. A truly overlooked gem. Splatoon 2 was probably my favorite game from this year. Xenoblade and Mario are tied for 2nd, then BOTW for 3rd (Sonic Mania as honorable mention). This was an amazing start to this console and I can't wait to see what 2018 has in store for Switch owners. ARMS was GOTY for me, everything else trailed closely behind it. We, the gamers, are the real winners here. Mario Odyssey is easily my GotY (Splatoon 2 takes second spot while BotW takes third spot), but I'm really glad 2017 was a phenomenal year for games. The Switch truly is a godsend, and I can't wait to see what lies in store for the Switch and all gaming in general for the next year. WHERE IS MARIO ODYSSEY?! By far the best game of the year (brand new) is Super Mario Odyssey! #5starmarioodyssey. You people need to think about what your voting! @Whopper744 I've seen so many online say it was their 2017 biggest disappointment. I still want it for sure but I've yet to really dig into Mario. Good stuff. Man, Nintendo had such a good year overall. 2017 was not only a good start for the Switch, but also a good sendoff/last "full" year for the 3DS. BotW is a masterpiece, really glad that it's getting a clean sweep in GotY awards. Sonic Mania is my GOTY, with Mario Odysee a close second. I liked BOTW a lot, but not as much as others here seem to. I actually prefer linear, more structured games so this is probably why - but I can still enjoy it for what it is and appreciate the achievment. Also, still really enjoying 80s Overdrive. Its flawed, but very compelling. PS Happy New Year everyone! Predictable, but there was a lot of good games all around this year. Predictable and not a bad list. My only difference is that I would have put Odyssey first and Zelda second. No real surprises there with the outcome. A very good year for Nintendo games. Anyone who voted Mario Kart 8 Deluxe over Xenoblade 2 is a nincompoop. p.s. Zelda was the deserving winner, Odyssey was great but I wasn't as blown away with it as I was when I first played Galaxy. No Xenoblade 2 by staff for even 5th place? Still; it's all opinions. Guys, do a favor to yurselfs and play Oxenfree. One of the best games i played this year, even if it come on the e-shop the last mont. Metroid Samus Returns on 3DS neglected one thing that could have really improved on it. The game is based in cavernous underground settings, which is enhanced by the marvellous 3D visual effects. However, the producers Mercury Steam neglected the 3D audio effects to supplement the great 3D visual effects. I would have expected a reverberation effect to simulate the echoes of gunshots and other sounds in that environment. For fun I connected the audio out from the 3DS to a Littlebits Korg music synthesizer, and got the Metroid game producing reverb on loud speaker (in mono though). All I did was connect power, microphone, delay and speaker bit modules together. It worked really well and I wished they added this feature into the game. Perhaps a patch is not completely out of the question to make this a truly classic experience. You know it’s been a stellar year when the likes of Golf Story don’t even get mentioned. Not that I’m claiming it to be a Goty contender but I fully recommend Vostok Inc - been warned though, it is highly addictive. I'm glad that Xenoblade made it there. I hadn't actually played it when I voted, but now I'm glad that I did. @Galenmereth The list I guess doesn’t, I’ve just seen a lot of hate for it elsewhere. For me it was probably my favorite indie from 2017. Of course others can have different likes, I just think it got more hate than what was really necessary. Xenoblade 2 is my game of the year by far. Sure, it's filled with a little too much anime cheese in the beginning but it tells a pretty grim and serious story if you can keep up with the mood swings. It jumps from homour to tradgedy from scene to scene and honestly I think XB1 did it way better. Character development and the world lore is much better so I'm conflicted on wich I prefer. And some voice work gives Tidus's laugh a run for it's money. But the combat, lore, scenery and music is superb. And I mean that so hard you should read that sentence a second time. That's how good I think it is. Overall it's one of the best games I've played this decade and it's absolutely the best I played this year. The Galaxy is at peace with this result! Ah, so Zelda did win over Mario. I didn't expect this, though I wouldn't have cried if Mario won (Mario is also great). I voted Zelda though, being a huge Zelda fan. Its also nice to see that Shadows of Valentia was more popular then I thought! It's kinda crazy to see how many GOTY awards Zelda Breath of the Wild has won (more than all other games combine according to https://gotypicks.blogspot.com/).